Nutri-Vet offers a wide range of unique, veterinary formulated animal supplements and complementary external products that promote health and well-being in dogs, cats and horses. 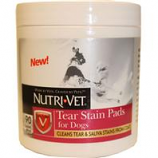 • Removes Debris and Helps Eliminate Tear Stains. • Promotes Vitality In Dogs Of All Ages. • Does Not Contain Petroleum Jelly Or Artificial Colors Or Flavors. • Hip & Joint Plus Provides All The Benefits Of Glucosamine Plus Msm, Chondroitin and Hyaluronic Acid To Support Healthy Joints. • Also Helps With Connective Tissue To Help Your Dog Stay Active and Enjoy Life. • 120 Tablets Per Bottle. • 75 Tablets Per Bottle. • Liver Chewables Help Support Normal Respiratory Function and Health In Dogs. • A Potent Combination Of Antioxidents and Omega Fatty Acids. • Supports The Immune System and Assists The Body In Combating Environmental Pollutants. • K-9 Aspirin For Small Dogs Is A Highly Palatable Liver Flavored Chewable That Aids In Temporary Relief Of Pain and Swelling. • 100 Tablets Per Bottle. • Contains Natural Oils and Lubicants That Help Reduce Hairball Formation In Cats Of All Ages. • Help Reduce Urinary Nitrogen Levels and Neutralize The Potential For High Ph Urine That Can Damage Grass. • This Tasty Wafer Promotes A Healthy Pet and Spotless Lawn. • Hard and Crunchy To Help Promote Strong Teeth and Healthy Gums and Are Made With High Quality Ingredients Your Dog Will Love. Kills and repels fleas ticks mites lice and mosquitoes. Kills repels and prevents re-infestation of fleas for up to 5 weeks. Kills repels and prevents re-infestation of ticks for up to 6 weeks. Kills and repels mosquitoes lice and mites for up to 4 weeks. Do not use on cats-may be fatal. Breaks the flea life cycle. Kills 5 kinds of pests fleas ticks mites lice mosquitoes flea eggs flea larvae. Kills flea eggs and flea larvae for up to 8 weeks. Kills repels and prevents re-infestation of fleas for up to 5 weeks. Kills repels and prevents re-infestation of ticks for up to 6 weeks.